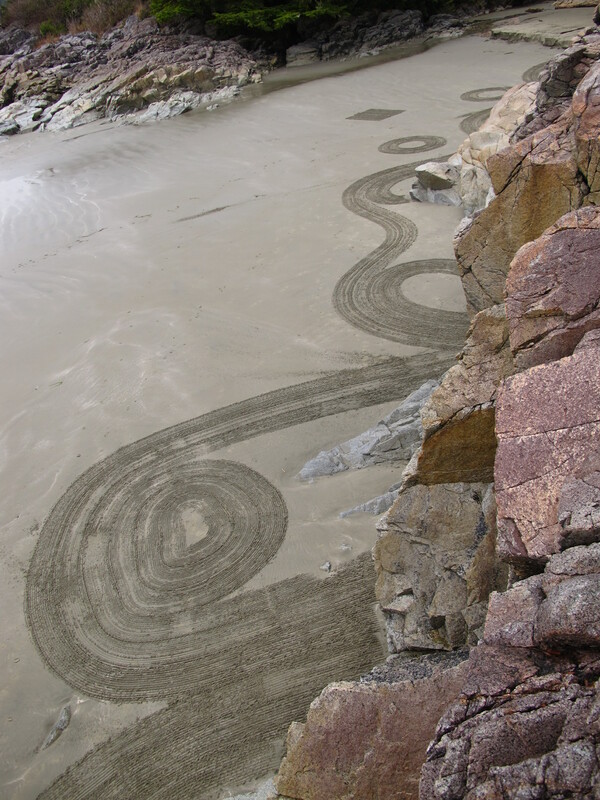 Inspired by the inimitable British “environmental sculptor” Andy Goldsworthy (Wikipedia page), who creates exquisite installations entirely from natural materials, i have taken to messing about on Tonquin Beach (Tofino’s secret treasure) with a rake and some free time. Tonquin Beach is different, in that the rocks are already there and i’m not about to be moving them around. 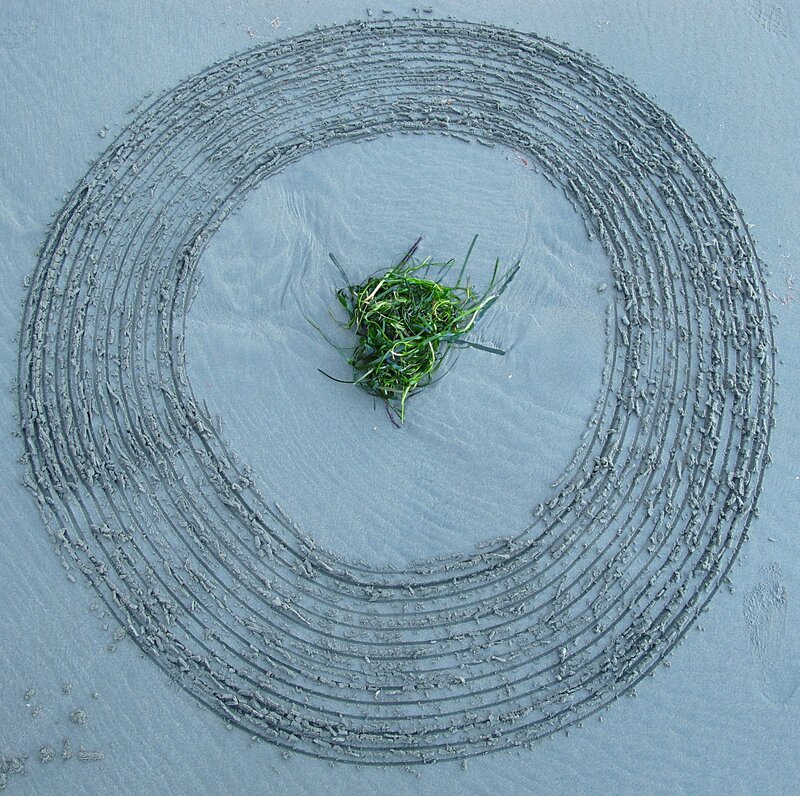 But that’s both the invitation and the challenge of the place — it’s an interesting exercise to use what’s there, along with the seaweed and flotsam that wash up, to try and create something aesthetically interesting. It turns out there’s a bit of technique involved, never mind the artistic considerations. 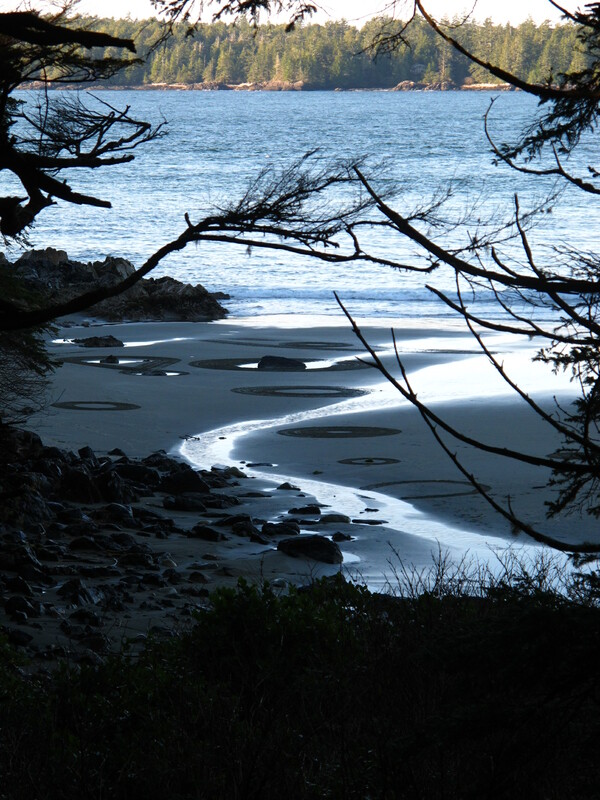 The sand behaves differently depending on whether it is dry or freshly exposed. You have to use the right rake for the sand conditions; too light and it won’t make an impression, tines too close and it picks up too much sand and doesn’t leave a clean set of grooves. Walking in large-scale smooth curves or perfect circles is another trick. As for the overall aesthetics of the piece — composition of the elements, artistic line, that sort of thing — there’s a lifetime of work and study involved. Here are a few more (click to enlarge). Raking on Tonquin has the signal advantage of no environmental footprint. One of the reasons i admire Goldsworthy is that so much (though by no means all) of his art is transient. It’s there, and then it decays, or melts, or washes away, or is deconstructed and put back where it came from. Only the photographs remain. With so many people on this earth, and some percentage of them producing artists, the lasting legacy of art is problematic. What do we do with an exponentially increasing amount of art that will never biodegrade? We can’t possibly preserve and display it all. So most of it will, necessarily, end up as landfill. Acrylic paint, for example, is plastic, tinted with strong chemicals; it will never disappear. I don’t want anything with my fingerprints on it to be sitting in a landfill a hundred years after i’m gone. Karesansui fits the bill. There is the issue of appropriating public space. Raking a pattern on a public beach is presumptuous, in that it may make people feel that they shouldn’t walk on it. That’s not my intention at all. I try to do my raking at slow times, so i’m not disturbed and not inconveniencing anybody. But it’s their beach as much as mine, and my thinking is that anything goes : walk on it, lay down on it, scuff it up, add to it, ignore it. 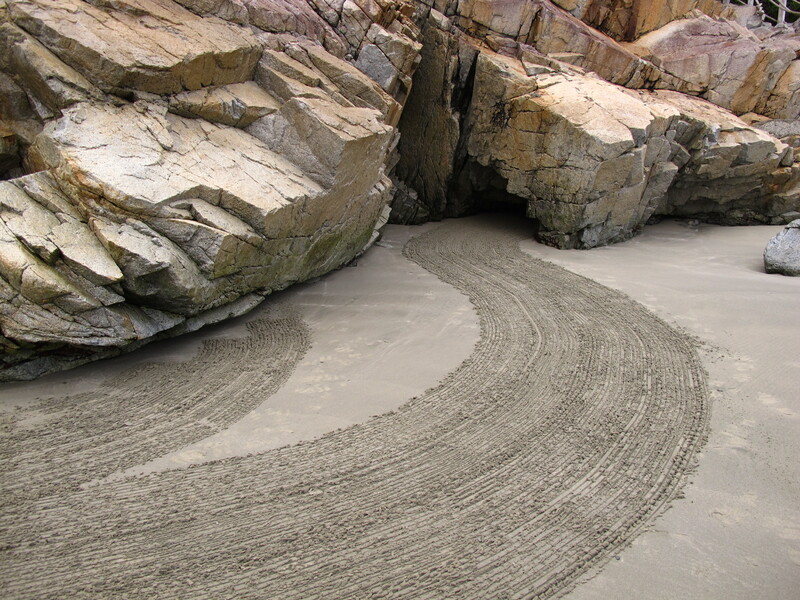 Sand art (as distinct from sand castles, another genre entirely) is not uncommon, and there are some striking examples such as British artist Tony Plant, California’s Jim Denevan, and New Zealand’s Peter Donnelly (profile), all of whom make careers partly from mega-scale installations around the world. Tonquin is more modest than that. One of its biggest challenges lies in not having a high vantage point from which to view the “canvas” in its entirety. The day’s piece must be composed, and viewed, from beach level, and it’s a tricky to make something that works from that perspective. It’s like viewing a painting not from in front, but edge-on. The good thing is that, if you mess it up, it will be gone after the next high tide and you can start afresh. The bad thing is that if you mess it up, it’s in a public place and people are going to be seeing it until the next high tide. But it’s for certain that with a low enough tide, clement weather, and a suitable soundtrack on the mp3 player, it’s a pleasant way to spend an hour.